❶ The URL is not modified: whether Polylang is activated or not, the URL stays the same for posts, pages, categories and post tags. However the URL for the date and the author archives are modified to include the language code. It is indeed necessary to differentiate (for example) English monthly archives from German monthly archives. ❷ This option is checked by default if your Permalinks settings are set to Default. Compared to the option ❶, there are less compatibility risks with third party plugins and themes. 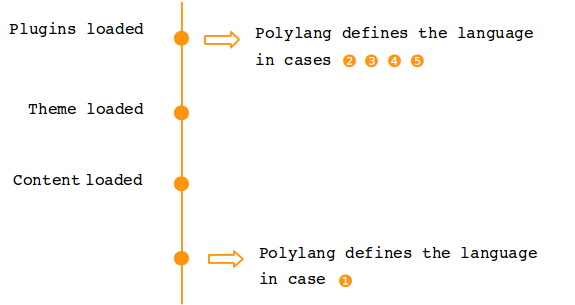 This is due to the fact that in the case ❶, Polylang defers the language definition compared to the other cases a explained in the diagram below. Note that, except with the first option which keeps as much URLs as possible, when Polylang is de-activated, every URL loose the language information and thus all external links are broken. 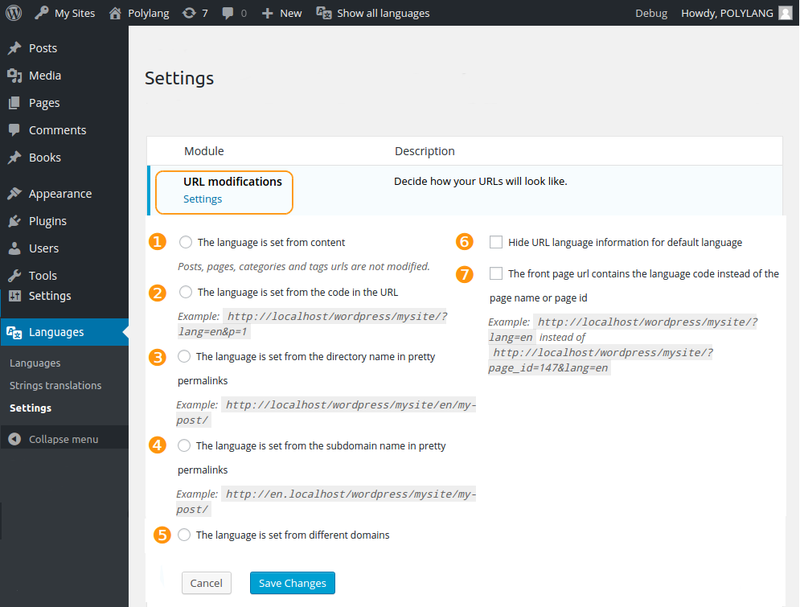 ❹❺ For advanced users, it is possible to use subdomains (or a different domain per language). All your subdomains (or domains) must point to the same directory (where the WordPress index.php is present). Polylang checks if your domains or subdomains are correctly accessible. Otherwise, Polylang returns an error message. Contact your host provider to get the documentation for the subdomains and domains installation. Note: we know that the interface of some host providers does not allow to choose the directory where a subdomain is pointing. Check with your host provider if it offers this possibility. This option is very useful if you install Polylang on an existing website as none of your existing URLs in the default language are modified. ❼ Here you can choose to include the keyword «language» in your URLs.